Using the shape memory effect, the KIT-Spin-off memetis enables high operating forces with better integrability and higher flexibility for miniature actuators. The memetis start-up team (left to right): Dr Marcel Gültig, Dr Hinnerk Oßmer, Dr Christof Megnin and Christoph Wessendorf. memetis enable large forces to develop and motions to proceed within a minimum of space. 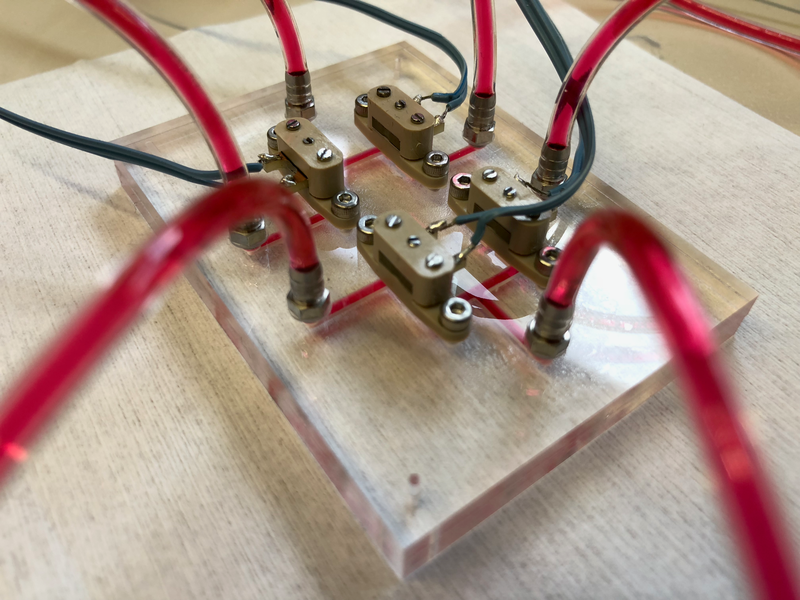 They have achieved this thanks to the development of foil-based miniature actuators made of shape memory alloys (SMAs). Shape memory alloys are metal alloys that can easily be deformed when they are in a cold state and return to their memory shape by themselves when they are heated up, in the course of which distances are covered and forces develop. Based on this, a multitude of components and systems in various industries can be further strongly miniaturised, which opens up entirely new options for application. From automotive and consumer electronics through aerospace technologies to medical engineering and analytics – the memetis SMA miniature actuators can be used just about everywhere, and with tailor-made benefits. 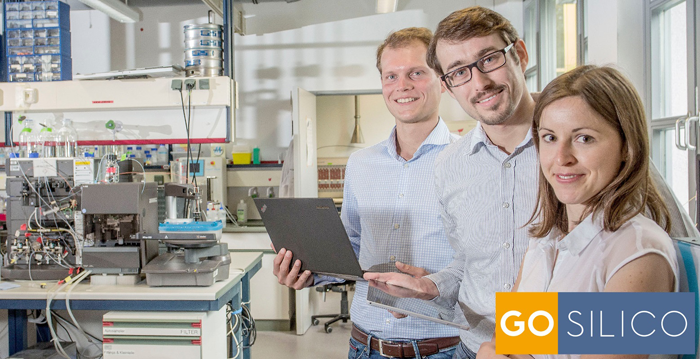 The company founders came up with this brilliant idea in the course of doctoral studies at the Institute of Microtechnolgy, which belongs to the Karlsruhe Institute of Technology (KIT). During this period, they had already gathered considerable experience with SMA miniature actuators, which boosted their determination to advance this technology in actuator design to market maturity and make it accessible for to a wide range of users. It is the declared goal of memetis to exploit the full potential of SMA actuator technology and make it marketable. memetis GmbH was officially founded in February 2017. The four young entrepreneurs will be supported by the programme EXIST Research Transfer Phase I up to September 2018. 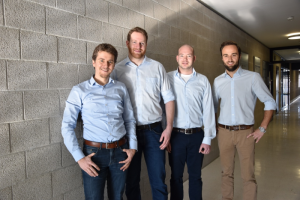 The further advancement of the technology and its adaptation to client requirements has been entrusted to Dr Marcel Gültig, Dr Hinnerk Oßmer and Dr Christof Megnin. 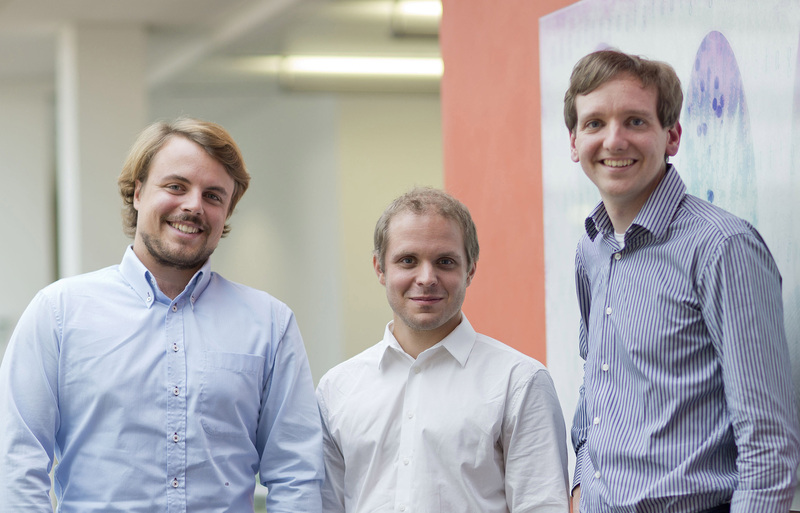 Christoph Wessendorf joined the start-up team in spring 2015 to see to the commercial aspects of going into business. They were thankful for support provided by the KIT incubator right from the start, both in terms of funding and financing advice and pitch training. “We were able to draw on an excellent network of mentors whom we got to know in the Accelerator Programmes,” Wessendorf comments. For example, memetis took part in upCAT, a KIT funding programme that supports start-ups in their early stages. Their mentor was Tobias Grab, who is currently in the process of establishing his second start-up, in addition to the KIT spin-off Cynora. With their move from Campus Nord to Karlsruhe’s western district in March 2018, memetis have taken a further step towards the business world – even though they will always maintain a link with KIT, also because of KIT having completed its participation in starting up memetis as a spin-off. The fluid system with four normally closed miniature valves for use in analytics. The spin-off Renumics GmbH uses machine learning methods to make Computer Aided Engineering more efficient and take the strain off computational engineers. Crash tests are an expensive affair. In early development stages, collision experiments are therefore often replaced by computer simulations that can be performed thousands of times taking various influential factors into account. These simulations are usually based on computer-supported processes, on so-called Computer Aided Engineering (CAE). This concept centres on computational engineers who compile numerical models, thus assisting constructors in the analysis and optimisation of their designs. The crucial time and cost factors here are the many manual work steps involved. For example, computational engineers invest a considerable amount of time in routine activities such as pre-processing geometries and integrating data instead of being able to concentrate on modelling and analytical work, which is precisely where Renumics comes in. This KIT spin-off has developed a software with which CAE can be auto­mated. In this context, machine learning methods help make simulations workflows considerably more efficient. 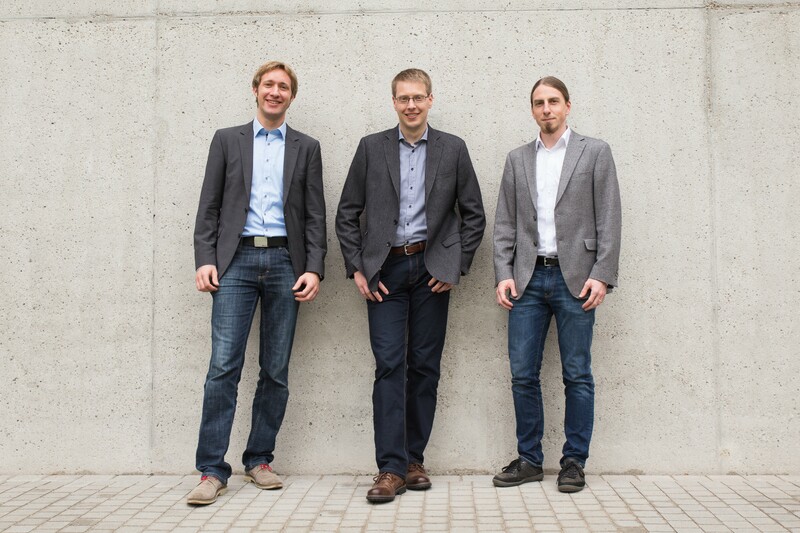 The Renumics founding team (left to right): Steffen Slavetinsky, Markus Stoll and Dr Stefan Suwelack. Enough experimenting! 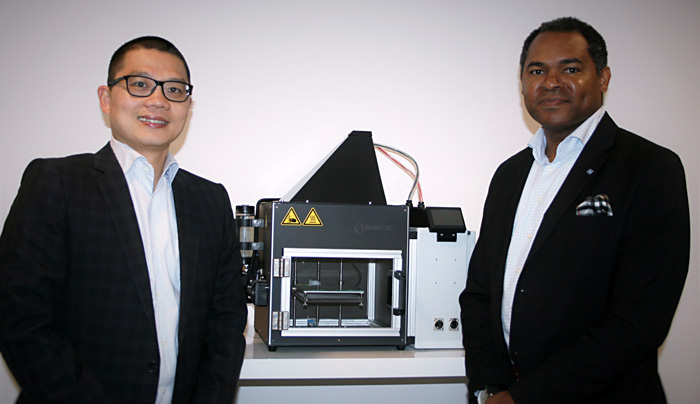 The KIT spinoff GoSilico enables the biopharmaceuticals branch to introduce the computer-supported development of manufacturing processes for new agents. The way from the discovery of a promising agent to its authorisation is tedious. It involves countless experiments that not only cause high costs but also require a considerable amount of perseverance. “It can take up to ten years for a drug to enter the market,” says Dr Thiemo Huuk. This is a shortcoming that he tends to address together with his co-founders Prof Dr Jürgen Hubbuch, Dr Teresa Beck and Dr Tobias Hahn.